Over 450 crowdfunding platforms now exist. But only two of them are household names. Kickstarter vs Indiegogo is usually the comparison creators make when deciding where to launch their product. They garner millions of visits each month, and hundreds of thousands of projects have been funded through them. Unless you have requirements that only niche platforms provide, you’re going to use one of these two. So does it matter which one you choose? Either way, you’ll get a world-renowned platform with proven success, but their difference can have major implications for your company. What follows is the ultimate showdown of giants Kickstarter vs Indiegogo who will win? You’ll find out at the end obviously. When it comes to branding, Kickstarter is miles ahead of Indiegogo. Kickstarter is basically the Hoover of the crowdfunding world. The name Kickstarter is often used as a synonym for crowdfunding, with many people unaware that it refers to one specific platform. So it serves as no surprise that Kickstarter is the best platform when it comes to traffic. In 2016, Kickstarter has garnered over 1 million unique visitors a day, or 30 million a month. Indiegogo, in comparison, gets around 9 million every month (and are much more secretive about it). The Kickstarter brand is also loved by the media. Because of strict quality control (see project flexibility below), reporters know they are less likely to end up sifting through heaps of garbage. You may be tempted to stop reading here. After all, when it comes to raising funds, more visitors mean more pledges. But Kickstarter has other benefits you’ll want to know about, while Indiegogo has a higher amount of flexibility that you might have to take advantage of as a tech startup. Another statistic that will probably have you running to Kickstarter is their success rate. Kickstarter boasts a success rate of 36%. That might sound low, but it’s by far the highest of any of the crowdfunding platforms. Take into account that this percentage accounts for around 100 000 successful crowdfunding campaigns, and you begin to see the bigger picture. Regardless of the type of funding, many startups fail. When you take into account how easy it is to sign up for a crowdfunding campaign, it makes sense that there’s an awful lot of dross (even with quality controls). If you have a good product and know what you’re doing, you are set up for success. Indiegogo, on the other hand, has around a 9% success rate. Are you running yet? Take a moment to breathe, Indiegogo does have perks that will put that 9% in context. One of the major reasons people choose Indiegogo over Kickstarter is their flexible policy towards “failed” campaigns. Kickstarter has only one option. You receive funding once the target has been met. If you fail to reach it, you get nothing. While Indiegogo does provide the all or nothing option, you can also choose to receive the funding as it comes in. There is a risk inherent to this – that you’ll end up spending other people’s money on a project that never materialises – but it provides a major perk. If you don’t hit the target, it does not mean your campaign is dead. You can keep the funding, and raise the rest of it from somewhere else. Also, you may need that money to build your working prototype. Keeping this in mind, Indiegogo’s 9% success rate sounds a lot better. That 9% includes only those that reached their full goal. Many other campaigners fell short but made their projects happen anyway. Another reason to choose Indiegogo as your crowdfunding platform would be your country’s eligibility. Kickstarter allows campaigns from 18 different countries, compared to Indiegogo, which hosts campaigns from around the world (224 countries). If you live in the US, UK, Australia, and much of Europe, this won’t affect you. But if you live in Africa, South and Central America, or Asia, Kickstarter is not an option. As a tech startup, the first two won’t present any problems. However, if you don’t yet have a working prototype, you’ll have to hold off on your Kickstarter project. Indiegogo is far less strict. Kickstarter enforced this rule by banning a massive project. The Skarp Laser Razor had been backed to the tune of $4 million on Kickstarter, before being kicked off due to scepticism over their ability to deliver. Indiegogo took them on, and they managed to raise $450 thousand. This was seen by some as a win for Indiegogo and their flexible policies. However, Skarp’s target date of March 2016 came and went with no product or even any updates. Comments from backers asking for answers were deleted. Eventually, Skarp did offer some news, but despite a giddy optimism from the founders, it does not sound very promising. 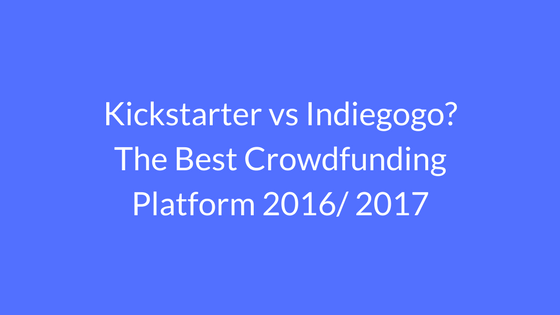 So, Indiegogo wins as the best crowdfunding platform when it comes to flexibility. But that’s not necessarily a positive. Kickstarter vs Indiegogo: Who won? So who won the ultimate crowdfunding platform showdown Kickstarter vs Indiegogo…. You’re more likely to see success with Kickstarter, due to its huge amount of traffic. And the branding will give your startup a boost in the eyes of the media. However, Kickstarter is not an option for everyone. If you’re not in an eligible country, Indiegogo is the next best thing. Or, if you’re not willing to take the “all or nothing” approach, Indiegogo offers an alternative. Furthermore, if you’re waiting on funding for a working prototype, Kickstarter won’t take you on. Kickstarter wins it for me, but Indiegogo is not at a bad alternative at all.